I love making soups year round and in the summer it’s likely to be a cold soup like Gazpacho soup made with my fresh tomatoes and herbs or Vichyssoise, made with leeks, onions and potatoes. Winter brings cravings for Corn chowder or an all time favorite of mine, Chicken Noodle Soup. I’ve made lots of versions of this soup over the years but after many experiments this is the recipe I’ve settled on. It’s quick and easy and freezes well too. I often double my recipe and freeze part for quick weeknight meals. Pour oil into soup pot and turn on medium heat. Add onion, garlic, celery, carrots, thyme and bay leaf. Cook and stir for about 6 minutes or until vegetables are softened but not browned. Add chicken stock and bring to a boil. Add the noodles and simmer for about 5 minutes and then add chicken and simmer for another 2-3 minutes to heat through. Remove bay leaf and thyme sprig and season with salt and pepper. Sprinkle with chopped parsley before serving. Enjoy this soup with a green salad and some crusty french bread and you’re set! Hope you enjoy this delightful comfort food. 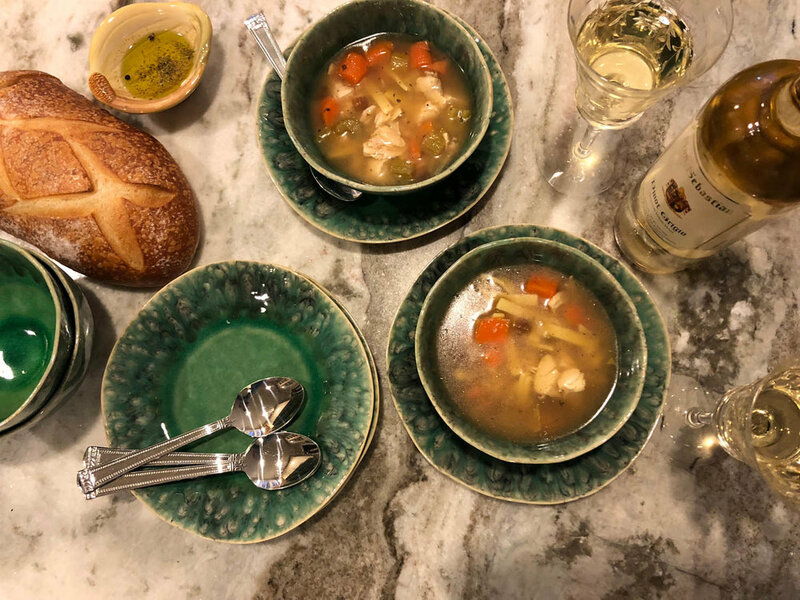 You might also enjoy my French Feast: Chicken Fricassee with Demi-glace Sauce recipe that I served at a special gathering, Wine & Words: Women’s Book Club Night. I’d love to share My Family Winery Story with you, too!